One part of Maryland’s economy is booming, and it’s not the tourism industry. It’s the illicit drug market. Drug-trafficking organizations have found a niche in the Old Line State’s black market for selling heroin – namely in Baltimore. The city has a long history of an illicit drug sub-economy, but the skyrocketing rate of heroin use in recent years has brought this issue to the forefront. Experts estimate that heroin traffickers make about $27 billion per year around the nation. Baltimore makes up at least $165 million of these profits – likely much more when calculations add money from occasional users. The ballooning heroin epidemic in Baltimore isn’t just a matter of economy, however – it’s affecting the city’s workforce, communities, and families. The war on drugs has cost the United States over $1 trillion so far, but the battle in Baltimore is just beginning. From 2008 to 2014, Maryland experienced a five-fold increase in the age-adjusted rate per 100,000 people visiting emergency departments for heroin-related problems. The rate soared from 5.3 in 2008 to 26.4 in 2014. The number of heroin-related deaths in Maryland has also skyrocketed, jumping from 534 people in 2015 to 918 people in 2016 (January to September of each year). This is the highest heroin-related death toll in the state in more than a decade. Heroin has always been a problem in Maryland. The heroin epidemic dates back to the 1950s. The so-called Heroin Highway is the nickname for the corridor in Interstates 70 and 81, beginning in Baltimore and traveling through Maryland, West Virginia, and Virginia. However, recent data points toward an explosive increase of this dangerous drug in 2016, starting in Baltimore and trickling down throughout the rest of the state. Today, there are an estimated 48,000 heroin addicts in Baltimore – as many as one in every 10 of the city’s residents. The City currently has the highest per capita heroin addiction rate in the entire country. The recent increase in heroin use in Maryland is due to several factors. The drug has attracted thousands of new users due to a combination of increased drug availability and reduced price. Baltimore is notorious for being purer and powerful than in other locations, due to the city being a key distribution point for high-purity heroin from South America. People believe that since the heroin is purer, it’s safer to use, making the rates of use grow even higher. Increased drug availability is due in part to the legalization of marijuana in many states. Mexican farmers who had been growing and selling marijuana on the black market have switched to cultivating poppies – the source of heroin. The U.S. supply of the drug now largely comes from Mexico and Columbia instead of from Afghanistan, the world’s leading heroin producer. The drug is coming into the country and drug traffickers are moving it in larger volumes now than ever before. As the supply of the drug increases, so does demand. Another major factor contributing to the increase of heroin in Maryland and around the country is the rising problem with prescription opioids. Heroin is a form of an opioid. Although illegal, it has the same or similar effects as legal medications including morphine, methadone, oxycodone, hydrocodone, and buprenorphine. Some physicians make these addictive painkillers widely available to patients complaining of chronic pain and other issues, prescribing Percocet, OxyContin, Vicodin, and many other opioids loosely. Addiction to these opioids often leads to heroin – a cheaper form – use for the same effects. The Drug is cheaper than prescription pills and is more easily obtained in Baltimore. A kilogram of heroin is selling for record-low prices these days, falling from around $160,000 20 years ago to between $60,000 and $70,000 today. A heroin addiction is cheaper to sustain than a prescription opioid addiction, leading to an increase in demand for the drug on the streets of Baltimore. It is easier and faster to obtain than prescription pills and achieves relatively the same high. The wave of prescription pill abuse across America has undoubtedly contributed to heroin abuse in Maryland. Prescription pill addictions have also taken heroin out of the typical demographic of poverty-stricken Baltimore streets and into cul-de-sacs and suburbs. The buyer demographic has changed, encompassing more people than ever before. What used to be almost an entirely low-income black market has transformed into a white upper-class citizen market of people who start out addicted to prescription painkillers and moved into heroin. More widespread use and acceptance of this drug in different social classes and geographic locations are contributing to the overall increase in this dangerous drug on Baltimore’s streets. The drug has reached crisis levels in Baltimore and throughout Maryland, taking lives at a breakneck pace. To grasp the devastating effects it has had on the city, one must first grasp the nature of heroin addiction. Heroin is an opioid, meaning it works by binding to cell molecules known as opioid receptors. These receptors in the brain control the perception of pain and pleasure. Heroin disrupts the brain’s reward system, changing the way it perceives pleasures. It also affects critical processes such as breathing and blood pressure. It is one of the most – if not the most – dangerous drug available. It is remarkably addictive and powerful, leading to people developing a major dependence on the drug. Many addicts start using heroin recreationally but quickly transition into compulsive and uncontrollable drug use. The user develops a psychological need for heroin that surpasses the desire and ability to control use. It affects key points of the brain to such a degree that it’s almost inevitable to form an addiction after use. A drug user can quickly become addicted to the drug due to the powerful way in which it alters the brain’s pleasure receptors. Consistent use can make it difficult or impossible for the user to experience pleasure without the drug. Soon, the body will build up a tolerance for heroin, forcing the user to consume it in greater quantities to achieve the same euphoria. Without the drug, the user can experience painful withdrawal symptoms. These symptoms are often enough for the user to return to the drug or relapse. Users can inject, snort, or smoke heroin. The way the user introduces the drug to their body may play a role in becoming addicted to this drug. Studies have shown that users who inject, are more likely to become addicted than those who smoke the drug – likely due to the rush an injection provides that smoking does not. Injecting leads to additional health risks associated with needles, such as HIV and hepatitis C. A user may contract these diseases through sharing needles or other drug use paraphernalia. On top of health issues the drug can cause, users may also suffer from other chemicals drug dealers mix in with heroin to make more money. Street heroin in Baltimore is purer than other locations, but there is no guarantee that additives or toxic contaminants haven’t been added. These chemicals can clog major blood vessels that carry blood and oxygen to the brain, lungs, liver, and kidney, causing severe organ damage. The negative health effects of heroin ultimately lead to higher health care costs, wasted taxpayer dollars, and broken homes. One of the main deterrents for recovering from a heroin addiction is going through withdrawal. The potency of heroin can make coming down from the drug more painful and difficult than other addictive opioids. Withdrawals can involve cold flashes, diarrhea, vomiting, insomnia, restlessness, muscle and bone pain, and involuntary kicking movements. Withdrawal causes the user to experience intense cravings for more heroin, contributing greatly to relapses. Heroin withdrawal can be life threatening when not done in the right medical setting. Detoxification facilities have medications such as buprenorphine and methadone that bind to the same receptors as heroin but not as strongly. These drugs can help an addict slowly wean off the more powerful drug, eventually reducing cravings. Naltrexone, which blocks opioid receptors, can also help counteract the effects of a heroin withdrawal. Working with a facility can reduce the risk of relapse by making withdrawal less painful, and providing tools for healing in place of heroin, such as therapy and creative arts. Unfortunately, many people who go to emergency departments for heroin-related problems don’t seek treatment in rehabilitation centers. They are stuck in a vicious cycle of needing more heroin to feed an addiction, and then needing even more as their bodies become tolerant of the drug. Relapse is almost inevitable without the right support system. Sadly, many people in Baltimore don’t have access to support systems, rehab facilities, or treatment centers. Instead, they try to stop a heroin addiction on their own. Going through withdrawal alone can lead to coma or death, and it’s largely unsuccessful. The addiction is so powerful that it’s almost impossible for a user to quit without professional help. The need to return to the drug during painful and disorienting withdrawal symptoms is too great for most to withstand. Lack of available treatment centers for Baltimore’s struggling addicts is perpetuating the great heroin epidemic in this area. Knowing how the drug affects the minds and bodies of addicts can help put the growing problem in Baltimore into perspective. With tens of thousands of heroin addicts in the city, Baltimore is a breeding ground for disease, poverty, and the trap of an expensive drug addiction. Users spend an average of $50 a day feeding an addiction. In low-income communities, an addict can lead to unsafe and illegal practices to get money, such as prostitution or selling drugs. In a city where heroin addiction is rampant, the community and economy both suffer. Baltimore remains the best place to get cheap, pure heroin in the state. This has led thousands of people to drive to Baltimore every day – sometimes twice a day – to get their fixes. Heroin uses increased by 88% in Maryland from 2011 to 2013. New users flock to Baltimore on top of thousands of welfare recipients living below the federal poverty level who are already addicted to the drug. 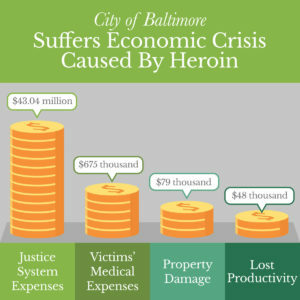 The influx in heroin-related activity in Baltimore has taken its toll on the economy, communities, and individual lives. Dubbed the Heroin Capital of the United States, Baltimore is entrenched in a decades-long fight against the drug that’s only growing more dismal in the eyes of lawmakers and police officers. Despite ongoing efforts to reduce the amount of illicit drugs in Baltimore, the concentration of poverty and easy access to cheap heroin has made it an uphill battle. Meanwhile, the people suffering the most are Baltimore’s own citizens. For decades, the lack of well-paying blue-collar jobs in Baltimore has perpetuated the issue of getting a legal job versus selling heroin and other drugs. In the 1970s, much of Baltimore was full of factories and industrial jobs. Since then, however, the city’s industry has turned toward tourism. Working-class communities could not adjust to this transition and fell between the cracks. The lack of gainful employment led to an increase in heroin use, sales, and distribution. It has created a vicious cycle in which Baltimore’s youth can earn more from entering the drug trade than getting an education and gainful employment. Many of the city’s youth start selling it at remarkably young ages, introduced to the industry from family or friends. The drug trade fuels a lack of jobs and a lack of job fuels the drug trade. It’s an endless cycle where youth is almost always more likely to choose the more lucrative work of selling drugs than picking up shifts at the local fast food restaurant. “Successful” drug dealers easily earn hundreds of thousands of dollars. They flaunt expensive cars, designer clothes, and diamond-encrusted watches. These top dogs in Baltimore are what many impoverished teenagers aspire to be. Despite the low odds of them reaching this level in the local drug market, most youth in in the city would still rather try their hand in the drug trade than work for minimum wage. Crime is a major drain on Maryland’s economy. Baltimore City feels this loss the most, as its education, housing, and health care systems suffer from lack of funding. Counties on Maryland’s Eastern Shore suffer from subpar health and economic indicators, contributing the ongoing heroin problem. Available capital from taxpayers’ dollars goes to maintaining the criminal justice system and cleaning up drug-related crime instead of bettering the community. In the end, its Baltimore’s citizens who are suffering. The public also pays for drug-related homicide costs, including victims’ medical expenses if they go to the hospital while still alive. Luckily, Baltimore’s homicide rates are currently low, with fewer than five homicides in each county in 2012. Still, the public foots the bill for thousands of overdose injuries and deaths, as well as treatment programs around the state. The massive amount of money Maryland has to put into health care costs to solve drug-related problems takes away from the potential to use the money elsewhere, such as anti-drug educational efforts. One of the most heart-wrenching ways in which heroin has impacted Baltimore is the devastation it has wrought on families. Any drug addiction can take a toll on a family and tear the family apart. The powerfully addictive nature of heroin can destroy families even faster than other drugs, due to the user’s need to feed his or her habit at any cost. The dangers associated with its use can take an emotional toll on an already strained family, often leading to irreparable damage. Heroin can create mental health issues within a family due to the overwhelming stress of a dangerous addiction. A parent with a heroin-addicted child may be at a loss for how to help, and eventually give up. A child with a heroin-addicted parent won’t get the physical and emotional availability he/she needs, leading to long-term mental health consequences. Feeding an addiction can create significant financial problems as well, leading to a lack of necessities that can impact the whole family. A parent may eat through savings, a child’s college fund, and any other available money to continue their addiction. Heroin-related deaths are devastating and completely preventable. A death in the family due to a heroin or other drug overdose can be an insurmountable tragedy, tearing a family apart instead of bringing it together. It’s important for families dealing with a problem to seek the proper professional help, such as therapy sessions or rehabilitation centers. It is possible to overcome a heroin addiction in the family with the right support system. Maryland’s criminal division sees a recurring problem in the way law enforcement deals with small possession crimes. Instead of tackling heroin abuse at the source of the problem and treating addiction, the law puts young people through jail, community service, or probation before putting them back on the streets. The same people get arrested over and over without anything changing. These marks against their permanent records don’t help pull them out of the cycle and don’t address the heart of the issue – heroin addiction. Instead, Maryland policymakers want to focus on providing more effective treatment of heroin addictions, preventing people – especially youth – from entering the system. Baltimore needs better schools and more job opportunities, as well as increased opportunities for addiction treatment. Lawmakers are attempting to fix Baltimore’s broken system by pushing for expanded access to treatment, better monitoring of prescription drug dispensing, and a reduction in sentences for drug offenses. Sentence reduction for minor offenders will work in two ways – it will help the offender get back on his/her feet more easily and it will save Maryland hundreds of thousands of dollars in incarceration costs. The state can then put the savings toward helping others stay out of jail, using more-sophisticated anti-drug programs and initiatives. Altering Maryland’s approach to heroin and drug dealers is an enormous undertaking, but the state is already taking steps toward this ultimate goal. Maryland’s decades-long fight against heroin has given the state ample time to create and implement anti-drug initiatives. In 2004, Baltimore City issued a needle exchange plan aimed at curbing the rampant issue of HIV and hepatitis C. The needle exchange program allows the addicts to swap used needles for new, clean ones without charge. This program has managed to bring the percentage of Baltimore citizens with HIV from drug use down from 64% in 2000 to just 8% in 2014. Maryland’s heroin increase far outpaces the national average and doesn’t seem to be decreasing. Heroin addiction in Baltimore doesn’t discriminate by age, race, ethnicity, gender, class, or income – the problem affects many communities in the heart of Maryland. As the demographic of the typical heroin user changes, policymakers are changing their approach to reducing drug abuse. Strict laws against drug users in the 1980s have transformed into a push toward treatment facilities and sympathetic care instead. Although this change should have occurred decades ago, it’s better late than never. More emphasis and city budget spent on proactive education solutions and rehabilitation centers can reduce the number of people misusing prescription opioids, becoming addicted to heroin, and relapsing during recovery attempts. Baltimore has been a major contender in the war on drugs for years, but recent increases in drug use have signaled a critical need for change. A new bill before the Maryland Legislature would allocate $12 million for residential drug treatment programs, $10 million for new anti-heroin task forces, and $7 million for more accurate prescription drug-monitoring programs. One such program is already making waves – the Maryland Prescription Drug Monitoring Program (PDMP). The PDMP is an electronic database that will gather and securely store patient prescription information. Health care practitioners and pharmacies will be able to access the PDMP to look up a patient’s prior prescription history. This will enable a practitioner to detect signs of prescription opioid abuse or misuse and notify the proper agency. It will reduce doctor shopping, one of the ways users get their hands on large amounts of prescription opioids. Doctor shopping involves a patient visiting more than one doctor, complaining of the same health condition, and receiving multiple prescriptions for painkillers. The Maryland PDMP is a major step toward reducing prescription opioid addictions and can potentially reduce the use of heroin as a byproduct. Despite dismal statistics regarding the growing heroin problem, Baltimore city officials are relatively optimistic for the future. There is a major transition going on within the system to address the source of addiction instead of simply punishing users. Addiction is losing its stigma as something only morally depraved or impoverished people turn to, as heroin and prescription opioid abuse seeps into nearly every community in Maryland. Instead of placing blame, officials are focusing their energies on how to curb this problem in the future. With a new political mindset, more funding in the right places, and more advanced data about Baltimore’s heroin epidemic, the Heroin Capital of the U.S. may have hope for returning to the Charm City yet. The best way Maryland citizens can facilitate a deep change in Baltimore and hope to prevent further damage to the community and economy is to spread awareness. The more people know about the dangers of heroin and other addictive drugs, the less likely they will be to try it in the first place. Education and awareness campaigns are helping to reduce drug addiction in other states, and can help Baltimore’s next generation. Baltimore’s future may be unclear and marred by a disturbing trend in the growing amount of heroin abuse, but Maryland is continually striving to achieve a balance approach to drug prevention. New policies and programs may help addicts get the help they need and cultivate a community of awareness. With more treatment facilities and other proactive measures available in Baltimore City, perhaps next year’s statistics will reflect a brighter, heroin-free future. Don’t Be Part of the Problem, Be the Solution! This entry was posted in Drug Addiction, Prescription Drugs and tagged Co-Occurring, Heroin on February 13, 2017 by mdrecovery.